Abundant features differentiate the Maya from other cultures of prehistoric Mesoamerica, but one that has fascinated explorers, scholars, and enthusiasts for centuries is Maya Hieroglyphic Writing. The calligraphic style and pictorial complexity of Maya glyphs are like no other writing scheme. Of the several pre-Columbian civilizations of the western hemisphere, the Maya civilization alone developed a writing system that provided an absolute expression of their language, thus they are the only indigenous natives of the Americas with a written account. Modern scholars are in agreement that the Mayan glyphs are one of only three writing systems in the ancient world -- the other two being Sumerian cuneiform in ancient Mesopotamia and Chinese -- to be invented separately. All others were most likely modeled after or influenced by existing scripts. 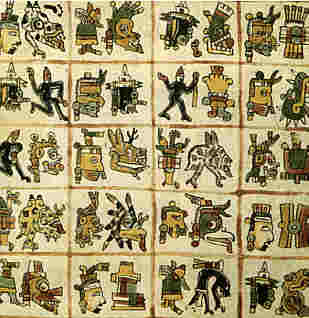 Mayan was the last of the three scripts to be deciphered, beginning in the 1950s .While only four of their folding-bark books survived the fanatical purges of the Spanish priests, their writings in stucco, stone and pottery remain. The Maya writing system (often called hieroglyphs from a shallow resemblance to the Ancient Egyptian writing) was a combination of phonetic symbols and logograms. It is most often classified as alogographic or (more properly) a logosyllabic writing system, in which syllabic signs play a significant role. .
Maya writing was called "hieroglyphics" or hieroglyphs by early European explorers of the 18th and 19th centuries who did not comprehend it but found its general manifestation reminiscent of Egyptian hieroglyphs, to which the Maya writing system is not at all related. The earliest inscriptions in an identifiably Maya script date back to 200-300 BC. However, this is preceded by several other writing systems which had developed in Mesoamerica, most notably that of the Zapotecs, and (following the 2006 publication of research on the recently discovered Cascajal Block), the Olmecs. There is a pre-Maya writing known as "Epi-Olmec script" (post Olmec) which some researchers believe may represent a transitional script between Olmec and Maya writing, but the relationships between these remain unclear and the matter is unsettled. With the decipherment of the Maya script it was revealed that the Maya were one of the little civilizations where artistsattached their name to their work. 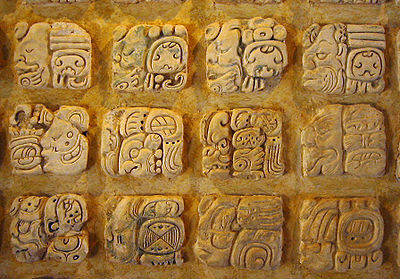 The calligraphic style and pictorial intricacy of Maya glyphs are like no other writing system. The Mayan script is logosyllabic combining about 550 logograms (which represent whole words) and 150 syllabograms (which represent syllables). There were also about 100 glyphs representing place names and the names of gods. About 300 glyphs were commonly used. The syllabic structure of the Maya language allows an ending consonant in a syllable. 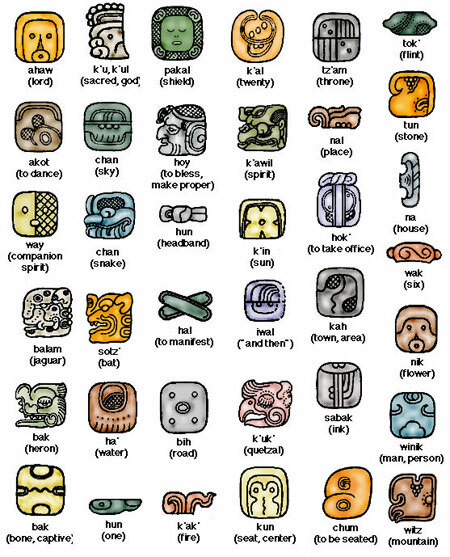 In fact, the "root" or most basic form of Maya words consists of a consonant, a vowel, and a consonant (CVC). In order to "spell" a word of this form, the Maya scribes used two syllabic signs. The first sign contains the beginning consonant and the vowel of the syllable. The second sign represents the ending consonant, and the vowel of this second sign is omitted by convention during reading. Most frequently the vowel of the second sign is equal to the vowel of the first sign. This is called the rule of synharmony by epigraphers. But perchance the furthermost progress was completed by Tatiana Proskouriakoff, who took a logical advance to monuments and texts on them. She noticed that stelas come in groups. Several of the recorded dates in a group do not seem to concern to any religious or astronomical events. In fact, the dates on these monuments fit with that of a person's life time. Proskouriakoff therefore theorized that at least some of Classic Maya texts recorded the lifetime of a ruler. Once the historical advance is opened, a multitude of glyphs were identified with events in life, such as birth, accession, death, and so on. In the early seventies, it became probable for the first time to work out dynastic lists of rulers in particular sites.